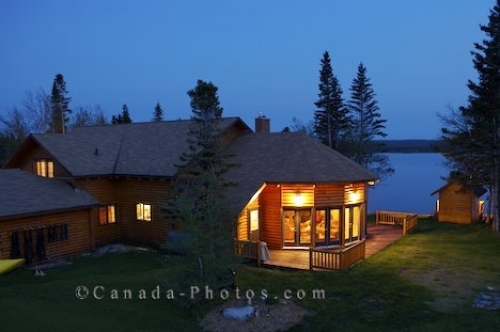 Accommodations surrounded by wilderness are extremely peaceful and this is exactly what you will get while staying at the Tuckamore Lodge near Main Brook in Newfoundland, Canada. As evening starts to close in around the Tuckamore Lodge, the bright yellow lights are illuminated which brightens up the landscape. Picture of the beautiful accommodations of the Tuckamore Lodge near Main Brook, Newfoundland as evening starts to move in.